These buttery ,melt in your mouth, avocado theplas will have you at first bite! Theplas are Indian flat breads from the state of Gujarat. This popular food is generally made of whole wheat flour and gram flour along with fresh fenugreek leaves. The dough has spices and oil added to it. I wanted to utilize the heart healthy avocado and extra virgin olive oil in creating this thepla . 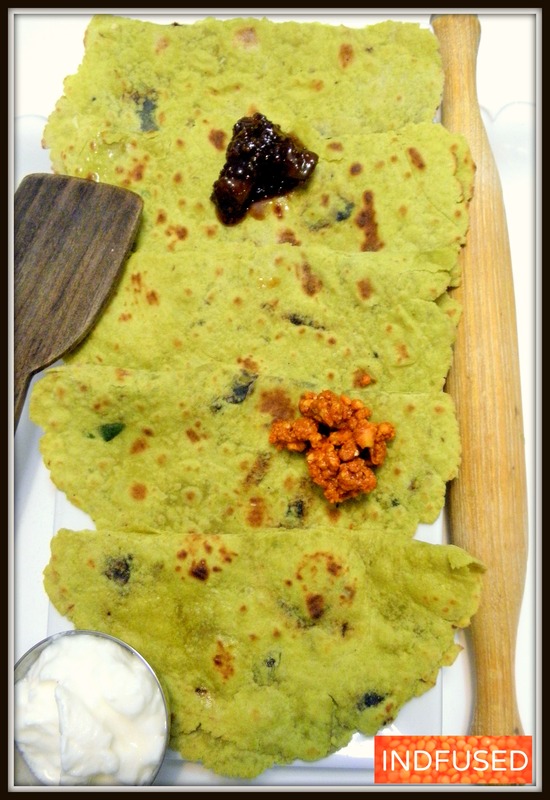 Gram flour or besan, adds to the protein content to this flat bread and tastes nutty and savory. I thought that the addition of sun dried tomatoes and spices, especially the carom seeds, would juxtapose well in this thepla. Plus, carom seeds help with digestion. But you know me ! The thepla had to taste good too. Well ,my husband and I finished all 8 teplas in one sitting. So needless to say, we loved the ‘melt in your mouth’ texture and the taste of these theplas. I served them with a spicy peanut chutney, sweet Indian mango pickle and plain yogurt. Yum! 1 tablespoon julienne cut sundried tomatoes. I like the Trader Joe’s brand as they are moist and do not require soaking. 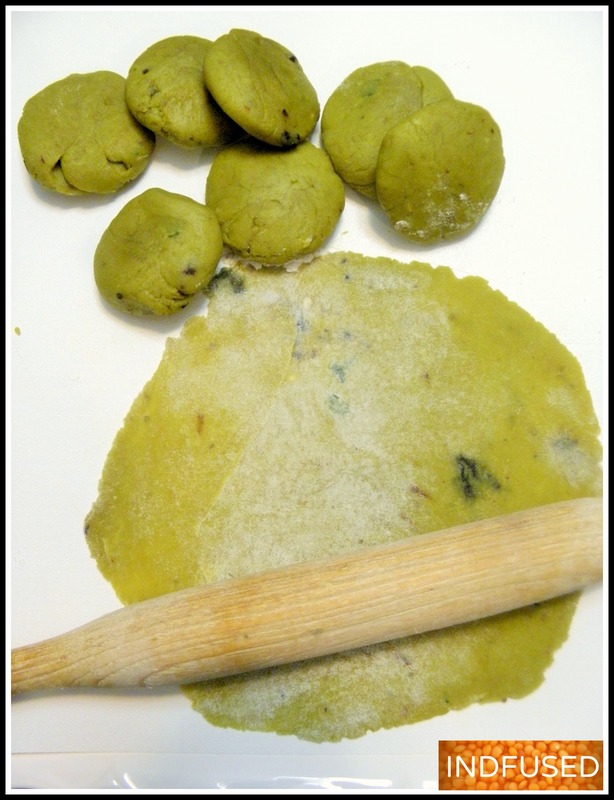 To make the dough, to the mashed avocado, add the garlic, chili, sundried tomatoes strips, the turmeric powder, ajwain and salt. Mix well together and add the gram and wheat flours. Knead it all together to make the dough. I did not need any water but it may be added, if needed to make a smooth ball of dough. Divide dough in 8 parts. Roll one part on a lightly floured surface into a circle about 8 inches in diameter. Roast on a preheated griddle on medium heat. turn and roast the other side. Brush the roasted thepla with ¼ teaspoon of extra virgin olive oil. Repeat with the other 7 dough parts. I serve theplas with a spicy peanut chutney, a sweet Indian pickle and plain yogurt. I hope you enjoy them as much as we did! Do let me know! Love these Sandhya, although I had never really heard of them. 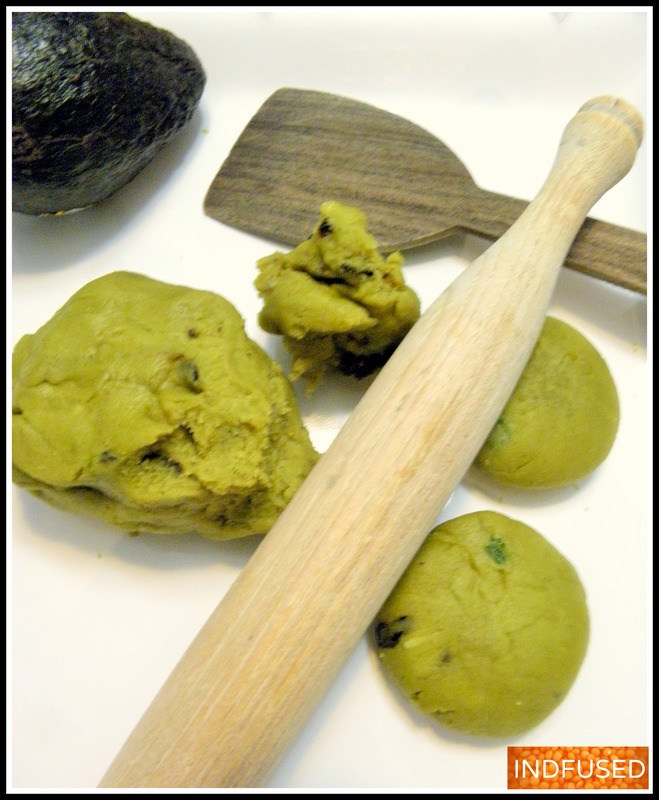 I love the addition of avocado in the dough. I can only imagine what it tasted like after reading all those ingredients. Perfect for the snowy winter you’re experiencing eh? Thank you Loretta. The avocado in the dough tasted yummy of course. But the scrumptious texture it gave the theplas was a nice bonus! Thank you so much! If you love avocados like I do, the theplas are sure to please!